What is the In Memory program? 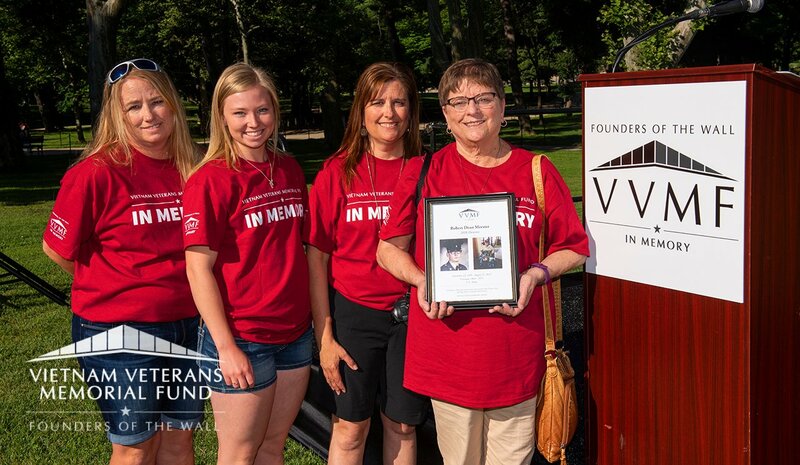 The Vietnam Veterans Memorial Fund’s (VVMF) In Memory program honors Vietnam veterans who returned home from Vietnam and later died. What is included in the In Memory program? How do I apply to honor my loved one through In Memory? Through a simple application process, you can have your loved one honored - at no cost to you. Click here to apply online or download a paper application here. Will my honoree’s name be added to The Wall in Washington, D.C.? No, the name would not be inscribed on The Wall. The In Memory program is to honor those who returned home from Vietnam and later died – which would not meet the Department of Defense guidelines set for inclusion on The Wall. For more information on DoD’s guidelines go here. Is there any representation of In Memory at the Memorial site? Yes, the In Memory plaque was dedicated in 2004 and is located near the Three Servicemen statue adjacent to the Memorial. The plaque reads: In Memory of the men and women who served in the Vietnam War and later died as a result of their service. We honor and remember their sacrifice. Why can't I find my honoree on The Wall of Faces? The Wall of Faces displays the names and information of those who are inscribed on The Wall. 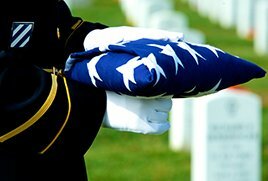 In Memory honorees have their online personal remembrance page on the In Memory Honor Roll. When will the honoree be added to the online In Memory Honor Roll? 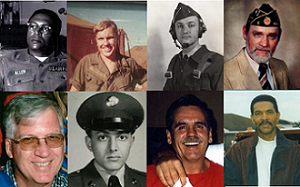 For those being honored in 2019, their personal remembrance page on the In Memory Honor Roll will be created before the 2019 ceremony on June 15th, 2019. When submitting documents online or by email please try to submit clear, legible documents and photographs. How do I know if my friend or loved one has already been inducted into the In Memory program? You can search the In Memory Honor Roll. The application and required documents are due by March 6th, 2020 to be eligible for the 2020 program. How do I get a copy of a DD214? Can I submit a biography? Yes, we encourage you to submit a biography to further honor your loved one. Biographies are preferably typed and no more than 300 words. If the biography is longer than 300 words, VVMF may edit for length. The biography may include any information which you are comfortable with sharing. John Smith was born on March 1, 1947 in Springfield, Wisconsin. He graduated from High School in 1965. John joined the Army in 1967 and did two tours in Vietnam serving as a flight engineer. On October 1, 1970 he married Jane Doe and they went on to have four children and three granddaughters. After leaving the Army, John worked as a maintenance mechanic for more than 30 years. He was a volunteer firefighter and an avid volunteer with the local VVA chapter and VFW post. He was incredibly proud of his service to his country. He also liked fixing cars and enjoyed carpentry. He had a wonderful sense of humor and was passionate in teaching his children and grandchildren new things. He enjoyed traveling whenever he could with trips to Mexico, Ireland, France, Texas, California, Florida, and Arizona. There was always room for golfing with friends and his wife. As any Wisconsinite, he was a Cheesehead who enjoyed cheering on his Packers. He passed away on October 7, 2010 due to Non-Hodgkin’s Lymphoma caused by exposure to Agent Orange during his service in Vietnam. John lived life to the fullest until the end and will be greatly missed by his friends and family. What will the biography be used for? The biography will be a part of the honoree’s online personal remembrance page on the In Memory Honor Roll. Does “hometown” refer to where the honoree was born or where he lived? This is up to you. It can be the location where they spent most of their time, where they spent their formative years, or where they had the greatest connection. What kind of photographs do you require? We do not require photographs to honor your loved one through In Memory, but suggest you send in two clear, different photos. The photographs can be whatever you would like. For example: service photos, prom photos, wedding photos or photos from a family trip. We recommend that one photograph be from when the honoree was serving in the military and one that is more recent. Photos will be displayed as a part of the honoree’s online personal remembrance page on the In Memory Honor Roll, on the printed personal tribute certificate and in the In Memory yearbook. • The best format to submit a photo is as a JPEG file. • Please scan your photo at a high resolution, this will look best when printed. If you are mailing in hard copies please send clear photographs - preferably not a photocopy. Please do not send originals as we cannot return them. What is the In Memory yearbook? The yearbook has the full list (including photos) of all of the honorees for the current year. You can view the 2018 yearbook here. Please take a few minutes and watch the ceremony video from last year: 2018 In Memory ceremony. When is the 2019 ceremony? Will VVMF pay for or arrange my travel to Washington, D.C.? 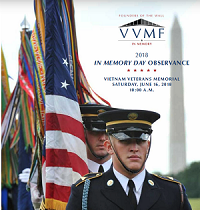 While we hope all family members can attend, VVMF cannot pay for or arrange your travel to Washington, D.C. We do provide bus transportation from the host hotel to and from the ceremony. Discounted hotel rate information will be available closer to the ceremony. How is the In Memory program/ceremony funded? 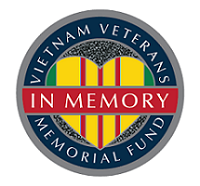 The Vietnam Veterans Memorial Fund is a nonprofit organization that is supported by private donors, like you. 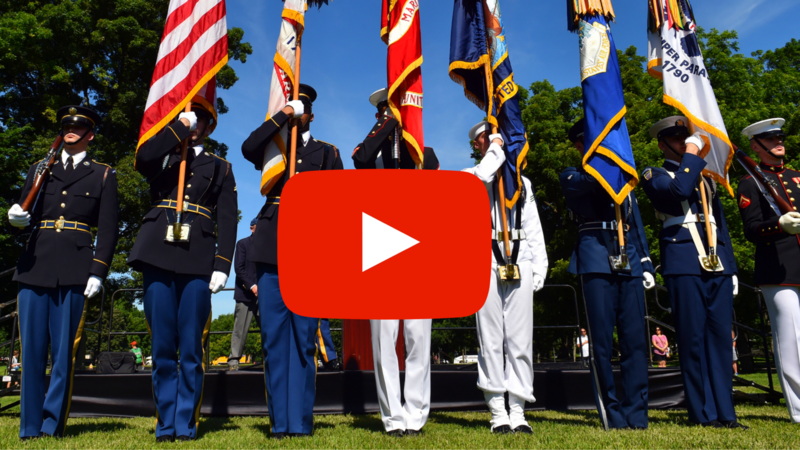 Your donations make it possible for us to maintain this program so critical to our efforts to promote healing and education, to hold the ceremony annually and to continue honoring many more veterans’ service and sacrifice. Please consider making a donation and support the In Memory program. Ceremony length depends on how many veterans are being honored each year. In 2018 we honored 345 veterans and the ceremony lasted about three hours. The ceremony begins promptly at 10:00am on Saturday morning. Plan to arrive no later than 9:45am to check in. Will there be seating at the ceremony? Yes, seating is provided for the ceremony. We will ask for you to RSVP to ensure we arrange for the proper number of chairs, but there is no reserved seating. How far is it from the bus drop-off to the ceremony location? The buses drop off about 500 feet from the ceremony. How far away are the bathrooms? The closest bathrooms are about 300 feet from the ceremony location. Will there be wheelchairs available? Although we do not provide wheelchairs, the ceremony area is typically wheelchair accessible. The ceremony is held on the grassy area and can be somewhat difficult to maneuver - especially if the ground is wet. There is no specific dress code. Past participant attire has ranged from casual dress to church dress. We recommend that you dress for the weather. The ceremony will be held rain or shine. Should it rain, the area can become muddy. We recommend that you wear comfortable shoes that are not easily damaged. It can be very hot and humid during the ceremony as it takes place in the open grass near the Memorial and there is there limited shade. We recommend that you bring at least one bottle of water for each member of your party. Hats and sunscreen are also strongly encouraged. Will I be reading my honorees name at the ceremony? Yes, you have the opportunity to read your loved one’s name during the In Memory Honor Roll Call. Our Master of Ceremonies will indicate when the reading of the names will begin. When you are at the microphone, please read your loved one’s name only. You may add their relationship to you, for example, “my husband, John Doe.” Out of respect to other families, please refrain from making additional remarks. If you are unable to attend the ceremony, a volunteer will take your honoree’s tribute to the stage and read your honoree’s name. You will then be sent two copies of the personal tribute certificate and one yearbook. What is the personal tribute certificate? The personal tribute certificate is a 9" x 12" certificate created by VVMF that contains the honoree’s name, photos, date of birth, date of death, dates of service in Vietnam and branch of service. What do I do with the personal tribute certificate? The personal tribute certificate is yours to take home as a lasting keepsake. Yes, VVMF provides a professional photographer at the ceremony. The photos will be available (about one week after the ceremony) for purchase on our website. Last year’s photos can be seen here. You will also be able to purchase additional copies of the personal tribute certificate after the ceremony. Will this event be televised? At this time it is not planned to have the ceremony televised, although we do plan to live stream the ceremony on our Facebook page. Please like our page to ensure you will be notified of the livestream and to stay up to date on the In Memory program. Can I come and honor my loved one next year? Yes, all past participants are invited to attend the ceremony each year. You do not have to re-apply, but will be asked to RSVP to the ceremony. How can I continue to honor my loved one? Please continue to visit and forward your loved ones online personal remembrance page on the In Memory Honor Roll, and post personal remembrances to them. You should also watch the schedule for The Wall That Heals so that you can visit when it’s in your area and see your loved one’s photo. How can I help others learn about the In Memory program? There are many ways to help spread the word about In Memory. The best way to start is to share your personal story about honoring your loved one. For information and ideas on how share your story click here. What is the In Memory Circle of Friends? The In Memory Circle of Friends is a community of supporters who are fulfilling the promise to Never Forget and who encourage one another through compassion and shared understanding. To learn more about supporting In Memory through this community click here. 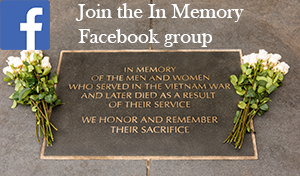 Please send an email to Julianna Blaylock at InMemory@vvmf.org or call (202) 330-4950.